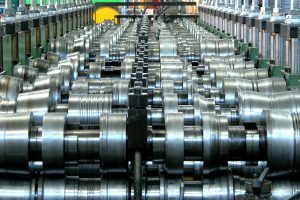 Officina Meccanica Tamborrino starts its own business at its new headquarters (which is also part of the current factory site of Scaffsystem), on a surface of 1500 sqm. At that time the founder, Mr. Vincenzo Tamborrino, works with more than 40 employees, mostly blacksmiths making gates and similar products in iron for clients in the Apulian region and surrounding areas. 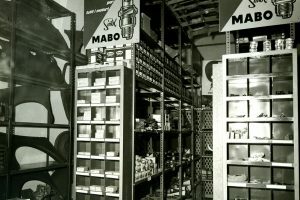 Metal shelves are still unknown, as Mr. Vincenzo makes his own prototype and with passion and enthusiasm starts his own production… at first only of bolted shelving and afterwards of boltless types as well, then followed by a specific version for storage of automotive spare parts. 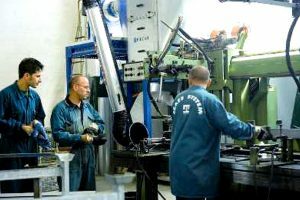 From that day onwards, production volumes start to grow along with clients’ requests and the old traditional production of light carpentry and iron gates and windows is set aside. 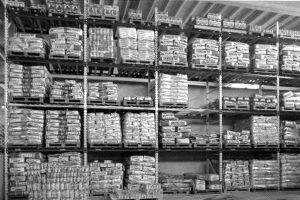 solutions, like the first pallet racking systems for storage of palletized items and heavy loading units. Many of those products will be kept in stock and as a result also space requirements will change very quickly: that is why the company needs to set up a new warehouse building on a 1600 sqm area. 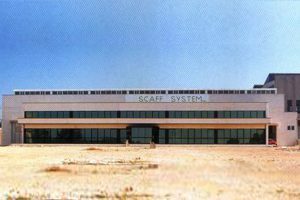 At the same time, additional investments in terms of company assets are made and Mr. Vincenzo’s children join the corporate group: Giusi, Annamaria and Licio start bringing their own contribution to the company’s development, finding their own role and position within the company group to provide renewed enthusiasm. This is surely the period in which the company experiences its most important transition: from an artisanal dimension to an industrial dimension. During this period, SCAFFSYSTEM goes through a radical transformation starting from the sales department: a network of salesmen is set up in order to promote and present the products in a wider area than the past. This change in terms of commercial strength leads to join MOVINT in Milan in 1992, one of the most important exhibitions in the sector: the company comes out of its own shell and begins working on a national scale. 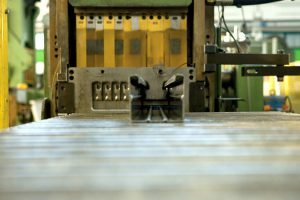 While commercial development begins in this period, production assets development has never stopped: two production lines are set up on an area of 2500 sqm, the first one for industrial shelving and the second one for medium duty shelving. Moreover, 600 smq are set up as office and exhibition area. This decade is characterized by a good visibility of the company on a national level, thanks to the first investments in marketing and communications: corporate catalogues and brochures, a website, presence at fairs as exhibitors. New business relationships are set up with foreign dealers and agents, who appreciate the quality of Scaffsystem products and its customer service over time. Scaffsystem keeps on growing by putting quality and safety at the centre of its own activity. 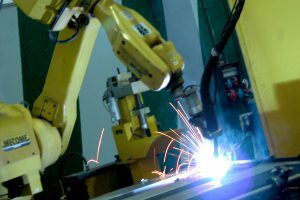 Thanks to some special agreements signed with the Polytechnic Institute of Bari University, the company tests all its main products in terms of resistance and applications. 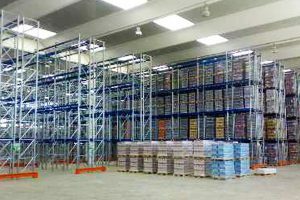 In this period a new construction system is introduced as far as mezzanines are concerned: its name is STRUCTURA and within few years it leads the company to a leading position on the Italian market for the production of storage systems and solutions for logistics. During this latest decade, the corporate business strategy gets designed better and better. 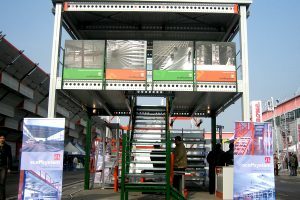 Scaffsystem attends a growing number of foreign exhibitions (e.g. Intermat Abu Dhabi, Cemat in Hannover, Libya Build in Tripoli, Batimat in Paris) and National events (e.g. Made Expo and Milan Furniture Fair). Research & development activities are constantly increased and lead to the launch of new products for the sectors of photovoltaicsand green-building. 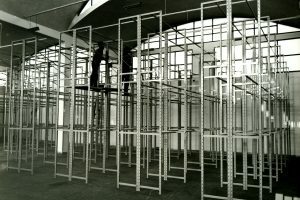 In particular, the focus is on the innovative construction method called STRUCTURA, which gets growingly appreciated by designers and building companies who need to produce steel structures for several purposes and in a more cost-effective and performative way if compared with traditional systems. 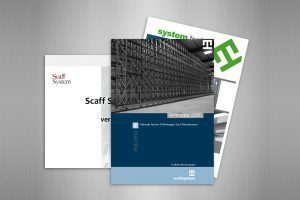 Thanks to the cooperation with System Integrators and producers of automated technologies for storage and handling, Scaffsystem also grows in the segment of automated warehousing solutions. This is the time when Scaffsystem enters the era of Industry 4.0, the fourth industrial revolution, and keeps on enriching its own identity by constantly boosting cooperations and synergies with associations. 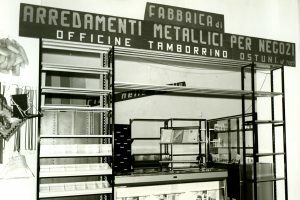 Another crucial project of this period is the launch of a dedicated corporate unit for design and for the production of a collection of metal furniture items branded Officine Tamborrino, recalling the past and the company roots but looking at the future at the same time, for a renewed enthusiasm and awareness.